As the muse of choreographer George Balanchine, Maria Tallchief was the first American ballerina to achieve international fame. Born Elizabeth Marie Tallchief on January 24, 1925, she was raised on the Osage Indian Reservation in Oklahoma. Her father, Alexander, was one of many Osage Indians who grew rich after oil was discovered on the tribe’s land. At the insistence of her strict mother, the family fortune financed a rigorous regime of lessons in dance and music, which Tallchief and her sister Marjorie began nearly as soon as they were able to walk. 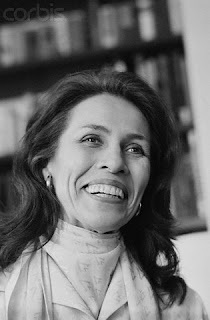 When Tallchief was seven, her family moved to Los Angeles, attracted by the superior training the girls could receive in the entertainment capital. She had regularly appeared in dance recitals for many years before becoming a student of Bronislava Nijinska, a famed Russian ballerina and choreographer. After five years of intense study, Tallchief began her professional career with the Ballet Russe de Monte Carlo, then the world’s best-known ballet company. At 18, she performed her first solo with the company in Nijinska’s Chopin Concerto. Two years after joining the Ballet Russe, she met George Balanchine, who was hired as the company’ s ballet master. A brilliant Russian-born choreographer, he would become Tallchief ’s greatest infiuence. Although she did not have the extraordinarily long limbs Balanchine usually favored in dancers, he was impressed by her strength, her speed, and most importantly, her incredible commitment to her art. Almost immediately, she became Balanchine’s favorite ballerina, a position that earned her leads in many of his ballets, including Danses Concertantes (1944), Le Somnambulist (Night Shadow, 1946), and Le Baiser de la Fée (The Kiss of the Fairy, 1946). 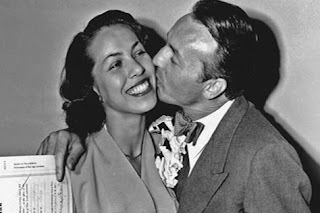 Their personal relationship blossomed as well: Tallchief and Balanchine were married on August 16, 1946. The following spring, Tallchief was invited to join the Paris Opera for a season as a guest artist, becoming the first American to perform on its stage in more than a century. After returning from Paris, she left the Ballet Russe to joined the Ballet Society (later renamed the New York City Ballet), a new company founded by Balanchine. The struggling company had its first major success with Firebird in 1949. Dancing the title role, Tallchief emerged as an international star. In just one of the many enthusiastic reviews of her performance, Walter Terry wrote, “In off-center spins, in sudden lifts, [her movements] seem to defy gravity, and in their alert, graceful, and sharp explorations of space, they define the characteristics of a magical, air-borne creature. ”Firebird was followed by a string of successful collaborations between Tallchief and Balanchine, including Swan Lake (1951), Serenade (1952), Scotch Symphony (1952), and The Nutcracker (1954). Their marriage, however, faltered. Separated in 1950, they had their marriage annulled the next year. In 1954, Tallchief left the New York City Ballet to rejoin the Ballet Russe for a salary of $2,000 a week, making her the highest-paid ballerina in the world. Soon, however, she found that she missed Balanchine’s creative energy and returned to his company after only a season. She remained with the New York City Ballet for 10 years, but grew more and more unsatisfied with her position as Balanchine began passing plum roles on to younger dancers. In 1965, she announced that she was leaving the company to devote more time to her daughter, Elisa, and her second husband, Henry Pashchen Jr. a Chicago construction company executive whom she had married in 1956. The Lyric Opera of Chicago lured Tallchief out of retirement in 1974. Initially asked only to train its singers to enter and exit the stage gracefully, she soon founded the Ballet School of the Lyric Opera. With Balanchine’s encouragement, in 1980 Tallchief also established the Chicago City Ballet, which concentrated on performing her mentor’s major works. Although she distinguished herself as a teacher, Tallchief was less successful as the artistic director of her own company. She severed ties with the Chicago City Ballet in 1987, and two years later it was disbanded due to lack of funds. Tallchief, however, remains a powerful force in the world of ballet, particularly as a strong advocate for the proper performance of Balanchine’s works. The U.S. government recognized her distinguished contribution to American culture by awarding her a Kennedy Center Honor in 1996 and a National Medal of Arts in 1999. Maynard, Olga. Bird of Fire: The Story of Maria Tallchief. New York: Dodd, Mead, & Company, 1961. Tallchief, Maria, with Larry Kaplan. 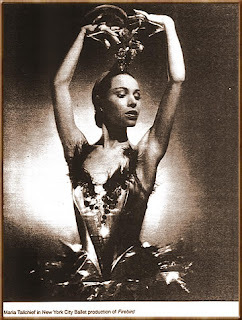 Maria Tallchief: America’s Prima Ballerina. New York: Henry Holt, 1997. Dancing for Mr. B: Six Balanchine Ballerinas (1989). Elektra/Asylum, VHS, 1995.